The Taoiseach has said Minister for Communications Denis Naughten's explanation over discussions he had about the Independent News and Media takeover of Celtic Media was "clear". Leo Varadkar did not make any further comments to reporters as he arrived at a special Fine Gael event to mark the anniversary of the Irish Republic coming into effect on Easter Monday, 18 April 1949. This afternoon, Mr Naughten told the Dáil he did not give confidential information to a PR executive acting for Independent News and Media on its proposed merger with Celtic Media. Mr Naughten addressed the Dáil this afternoon following newspapers reports that he had discussions with a public relations executive acting for INM about his decision to refer the proposed takeover to the Broadcasting Authority of Ireland. He confirmed that he spoke with PR executive for INM, Eoghan Ó Neachtain, but insisted there was "nothing wrong or inappropriate" with him as minister saying to anyone that if the plan for a merger proceeded he would take advice on sending it to the BAI. "This is not inside information but simply a reflection of the legislation itself. I had no inside information to give," he said. "It may have been preferable if the conversation did not take place, but I was by no means expressing a definitive view, nor could I do so at that time. Nor did I state that the view was confidential, as the [Irish Times] article stated," he added. Mr Naughten concluded that he had "acted to the letter of the law". Responding to later questions from Fianna Fáil’s Timmy Dooley, Mr Naughten said: "I, in no way, interfered at any stage of this process." In response to a query from RTÉ News, Mr Ó Neachtain said he would not dispute a single word of Minister Naughten's statement to the Dáil. The Communications Minister has the unequivocal backing of the Taoiseach this evening. Leo Varadkar is satisfied with Denis Naughten's statement in the Dáil. But in this world of new politics and minority Government, the imprimatur of a Taoiseach isn't what it used to be. The reality is that the minister's future in office could lie in the hands of the Opposition. All sides there are less than satisfied with what he has said in the Dáil. "Not credible" and "troubling" were just some of the words used to describe the minister's statement. But do they have the stomach to push this all the way to a confidence motion? Against the backdrop of a referendum campaign on the Eighth Amendment, there will be a major reluctance to travel that route. It is accepted too that any serious escalation of an issue under the "no surprises clause" of the Confidence and Supply Agreement will almost certainly spell the end for the Government. "The next big row will be the last," said one senior source. Instead, it is likely the pressure on the minister will be cranked-up as the opposition seek to inflict deep political wounds on Denis Naughten. Wounds that could still potentially end his time at the Cabinet table, but he might just limp on for now. 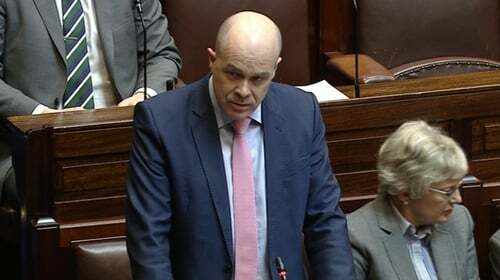 Minister Denis Naughten’s statement to the Dail is unlikely to be the end of the issue. The problem facing him is that he admits he gave information to a public relations executive acting on behalf of INM. While he says it was not "inside information", it was communication of material that was not yet in the public domain. Under stock market rules information regarding a potential acquisition by publicly quoted company should be given to all investors at one time if it is material or if it indicates an impact on future expansion plans. But Minister Naughten told the PR executive that he was likely to refer the matter to the BAI for its consideration instead of simply approving the deal. While the Minister said he would follow advice from his officials, he did give new information to the PR executive, Eoghan Ó Neachtain. He also confirmed he did not notify his officials about the phone call. In his defence, the minister says he gave his "personal opinion" and many people would have assumed he would have referred it the matter to the BAI in any case. However, his explanation is unlikely to quell concerns about the matter. Minister for Justice Charlie Flanagan said he was "very pleased" that Mr Naughten "addressed the issue head on with an early and comprehensive statement". He said: "it is clear to me that on the occasion of the call he had no information of a confidential nature to give anyone." Earlier, responding to Opposition questions, Mr Varadkar said that the information was not confidential or sensitive. Fianna Fáil leader Micheál Martin, Sinn Féin leader Mary Lou McDonald and Labour leader Brendan Howlin all raised questions in the Dáil about the report in today's Irish Times. They referred to the claims that plans by Mr Naughten to refer the proposed takeover of Celtic Media by INM to the BAI were relayed to Denis O'Brien, who is INM's largest shareholder. The Taoiseach said it would be better if this conversation had not happened, however he added he was satisfied that Mr Naughten had not revealed any confidential or sensitive information. "This may or may not have been a breach of new market abuse regulations," Mr Martin said, who called on the minister to clarify the matter in the Dáil. Ms McDonald said it was "a very troubling story and it undoubtedly raises questions for the Minister for Communications Denis Naughten around this discussion with a person acting on behalf of INM in relation to their attempt to take over Celtic Media". She said the PR company in question did not log the engagement with the minister with the Lobbying Register, even though there is a legal requirement to do so. Mr Howlin said these were "extraordinary revelations". He also said it would appear that Mr Naughten may have prejudiced his statutory functions under the Competition Act on approving media mergers. Social Democrat Catherine Murphy said Mr Naughten had told her in a Dáil question on 6 December 2016 that he had not yet made a decision to refer the proposed merger of Celtic Media and INM to the BAI and that he not received a report from his officials at that stage. However, she says the ODCE's affidavit says that the PR executive was told a month earlier, on 11 November 2016, that the Minister would be referring the merger to the BAI.